I’m posting some Paleo recipes, per request. Some of these I have gotten from The Paleo Diet book, and the majority of them are from stalking other Paleo-eaters blogs. Either way, give them a try and add or take away ingredients if you’d like. 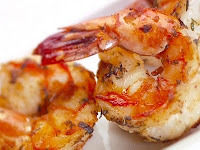 You can use ready-to-eat peeled shrimp or the raw, frozen kind. I got the raw, frozen medium shrimp. heat, the skillet to medium and throw the shrimp in. If using frozen, give them a bit to thaw on the skillet before you add olive oil. Once the shrimp is ready to absorb moisture and spices drizzle or pour (depending on how much you want to use) in the pan, over the shrimp. Squeeze half a lemon on top. Should take about 4-6 minutes at the most. I modified the original recipe; because I didn’t want to spend money on a big jar of tahini. Instead I bought sesame seeds in bulk, sprayed organic olive oil cooking spray in a pan on medium heat and toasted the sesame seeds for about 3 minutes. Place the seeds aside and start the veggies. Steam broccoli and kale in a deep saute pan by letting them cook for 2 minutes or so. Add about 3 T. of water to the pan and cover. Let steam for 5 minutes or til desired texture. Toss broccoli, kale, sesame seeds, olive oil, and lemon juice in a bowl. Eat it up and save the left overs, add some chicken and you’ve got tomorrow’s lunch! What about breakfast you say? You can find the recipe for Paleo Pancakes here. 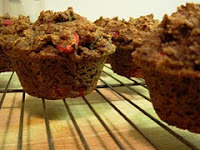 Preheat oven to 350 and spray muffin tins with organic cooking spray or line with paper cups. Combine dry ingredients in one bowl. Combine wet ingredients in the other. Stir wet into dry and fold in apples. If you’re counting calories, one equals 85.5 cals.